Planning has started and we are getting ready to celebrate our 2016 VAHS Prom in Old Hollywood style! VAHS Junior/Senior Prom will be held on April 9, 2016 at Umstead Pines Country Club. Tickets are on sale now in the high school front office. Ticket Prices: $45 individual/$80 couple until March 1, 2016. A free ticket raffle will be held for students who have purchased tickets by March 1st!!! On and after March 2, 2016 tickets will be $50 individual/$90 couple. 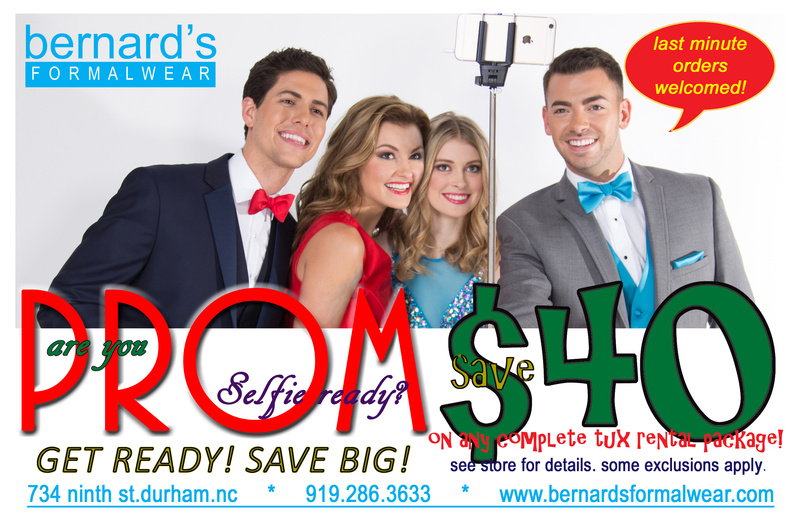 Bernard’s FormalWear on Ninth Street is offering Voyager students a tuxedo rental for $40 and also an opportunity for a free tuxedo. Students, make sure you let them know that you are from Voyager and we will get money back for prom expenses. Coupons are attached. All after school activities, including all sports, are canceled. Aftercare will operate until 4:30. All High School basketball games scheduled for tonight, Friday the 15th, have been moved to the Middle School gym. The athletic department has received a generous gift of two pair of tickets to the Duke v. UNC mens basketball game at the Dean Dome. Raffle tickets for a chance to win these tickets are now on sale at the Athletic Office. Tickets are 1 for $10, 8 for $50 and 20 for $100. The drawing will be held between the girls and guys Roxboro Community home game, you do not need to be present to win, just able to pick up actual tickets before game day. The Duke at UNC game is February 17th at 9pm. All homecoming presentations, of homecoming court and King and Queen, will take place at half time of this Friday’s Boys Varsity Basketball Game. Parents, please read the below linked letter from Managing Director Jennifer Lucas regarding revisions to the Student Code of Conduct policy. Action is required on your part. Thank you!